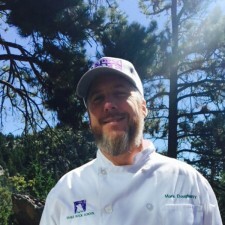 Mark Dougherty is the head chef instructor at Eagle Rock School and Professional Development Center. Mark is responsible for procurement of all food as well as menu development at Eagle Rock. Mark also teaches hands-on classes in food safety and sanitation, knife skills and equipment identification. Mark has worked in hotels, restaurants, corporate catering and private households in New York City, Connecticut, Vermont, Florida and North Carolina. He is a veteran of the U.S. Coast Guard, and a graduate of New England Culinary Institute in Montpelier, Vt. Mark Lives in Loveland, Colo., with his wife and two teenage daughters. My rock is my family at home and Eagle Rock School. My favorite part of Eagle Rock is the diversity of cultures. If everyone had a unique template like Eagle Rock School from which to learn, the world would be less judgmental and more understanding of the complexities of the human being. I love people who are true to themselves and others. Students inspire me when they show me they are very capable of learning. Everyone has good and bad in themselves. Recognizing the differences between the two and how you handle them is a vital part of proper communication.